Issue 0 was cool, Issue 1 is even cooler! 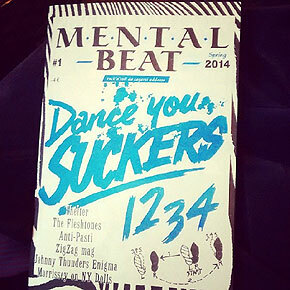 Printed in black and blue on white paper, Mental Beat offers us an interesting mix of old and new rock’n’roll in both English and Italian: Interview with The FLESHTONES, Zig Zag Magazine ( the first rock magazine in the UK), and Mike Hudson (about Johnny Thunders’ death), articles about The NEW YORK DOLLS by Morrissey (from Scottish fanzine The Next Big Thing), ANTI-PASTI and Krishnacore band SHELTER (wish I could read Italian foir this one! ), a few record reviews and old RAMONES posters, plus a Johnny Thunders crossword puzzle that taken from Sonic Iguana magazine. A quick read when you can’t read the parts in Italian, but an excellent, and great looking fanzine!/Laurent C.